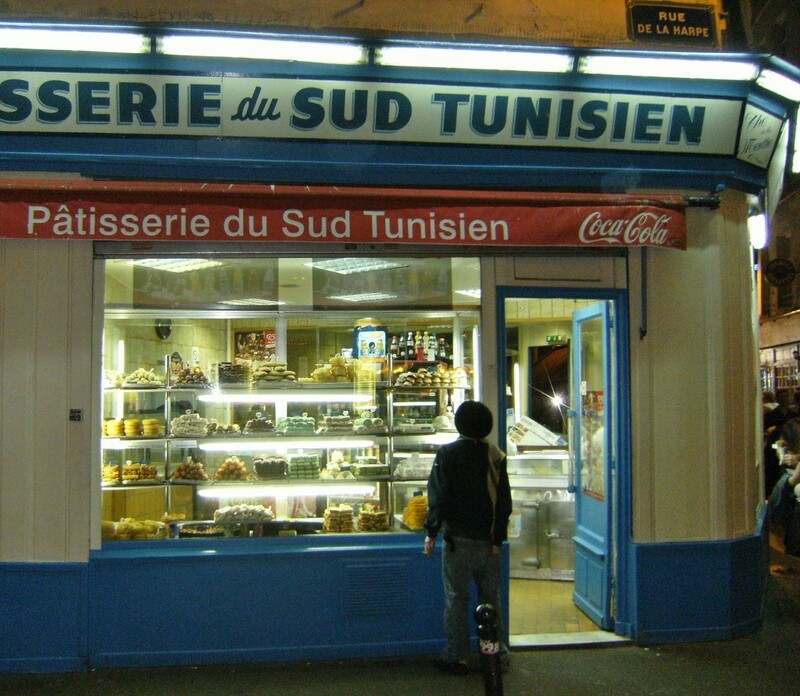 Amy and I’s favorite boulangerie. Go early in the morning for a fresh croissant. Still warm from the oven, it’s the best croissant I’ve ever eaten. The buttery layers literally melt in your mouth. 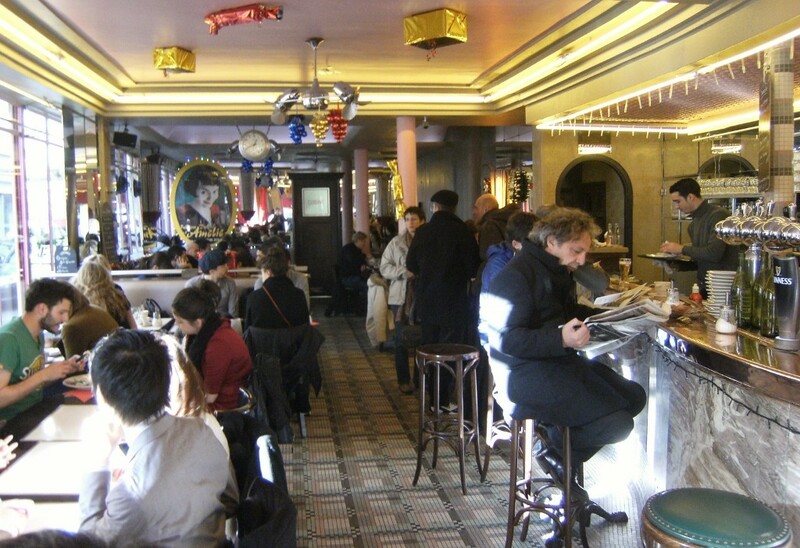 We come here first and then walk over for a café au lait at Café Hugo, which overlooks Place des Vosges. If pastry chefs were Hollywood stars, these would be some of the A-listers. 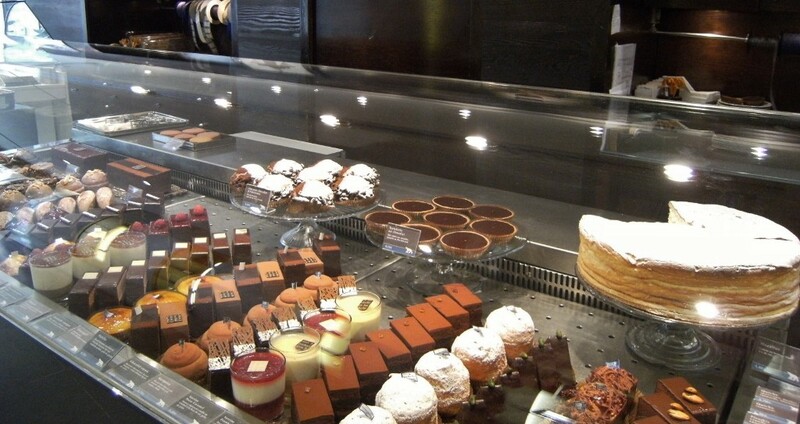 On a daily basis, I like going to the local boulangerie down the street, or my favorite, Au Levain du Marais, but these boutiques produce some really inventive, almost perfect pastries that are worth checking out. 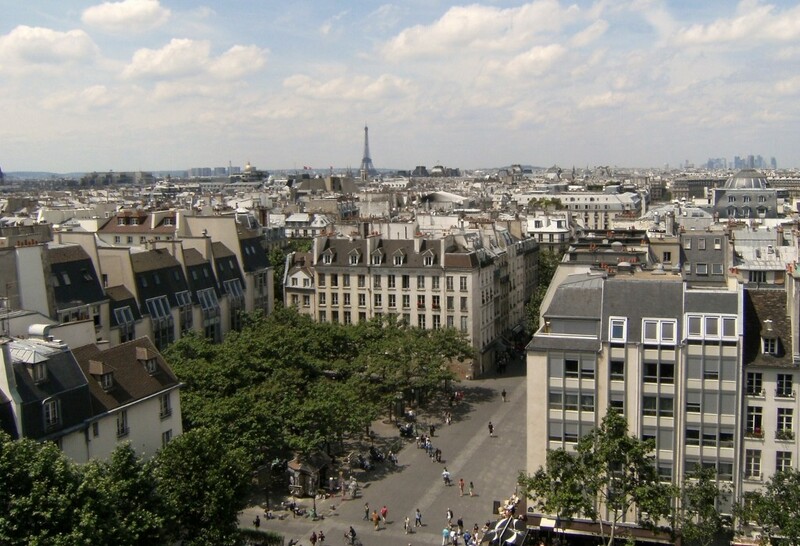 Most have multiple locations in Paris, so keep an eye out. I first learned about Poilâne in The Bread Baker’s Apprentice. On the cover is a Poilâne knockoff (which at first I thought was a giant bread medal…right?). The author describes Poilâne’s bread as one of the best in the world. 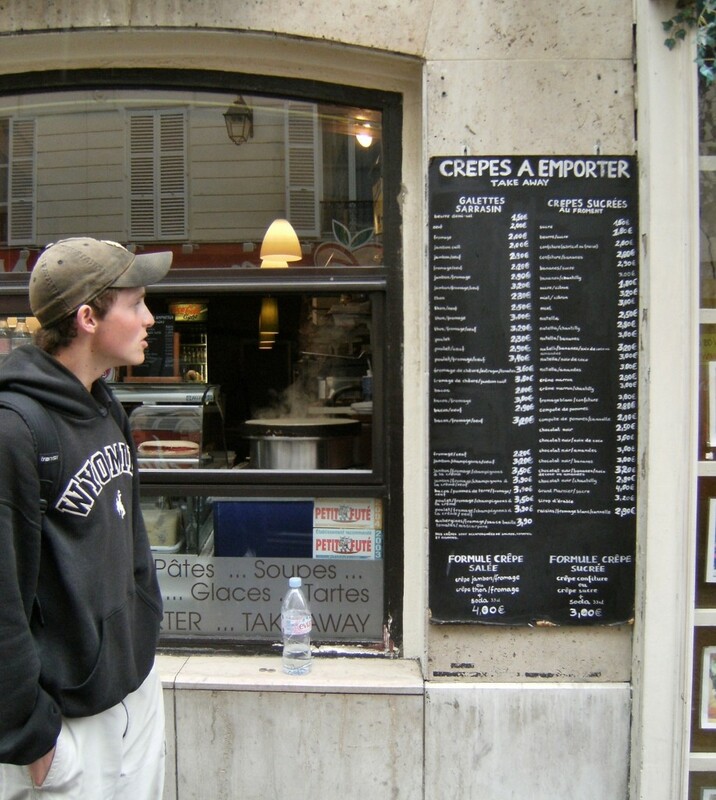 Ever since reading that line, I wanted to try it, so it was one of the first things I did when I arrived in Paris. 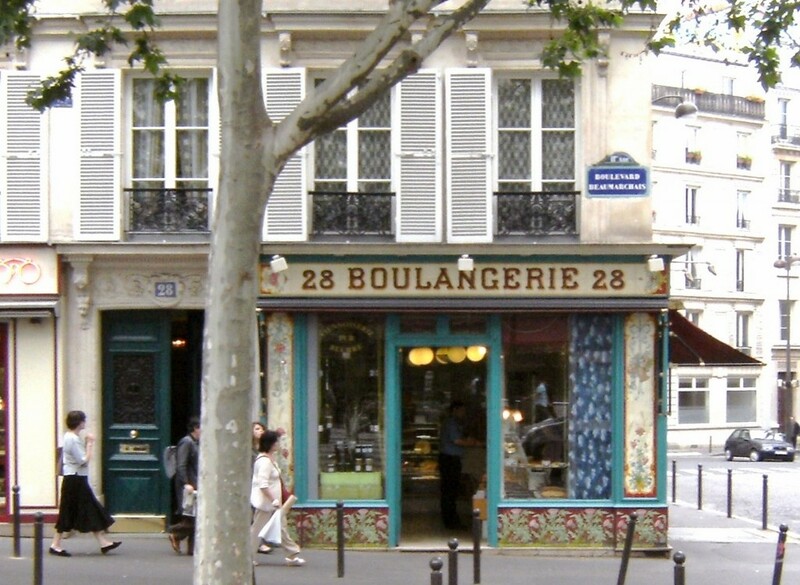 His shop near the Eiffel Tower is humble, made of worn wood and old boulangerie charm. The loaf, called a “miche,” is giant and complexly flavored. Best in the world, I don’t know, but definitely the most unique. It’s chewy but crunchy, earthy but light. And now I have tasted it! 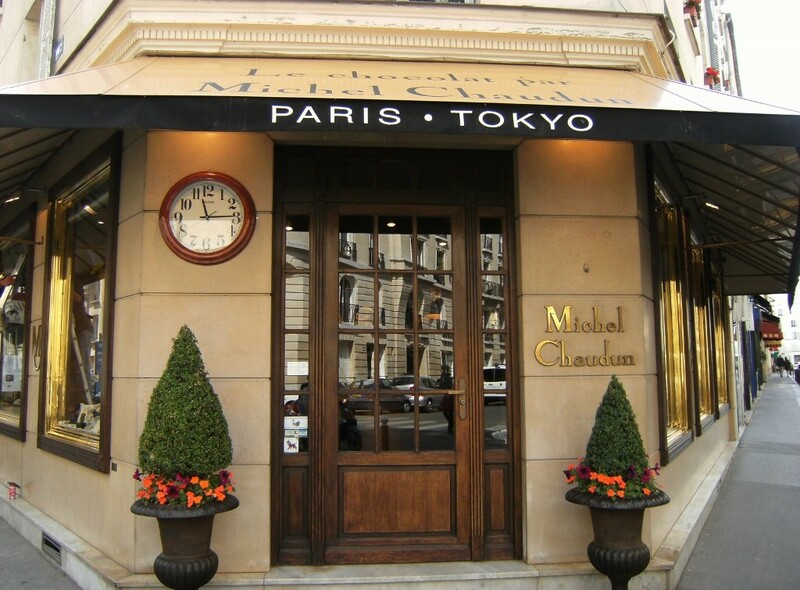 49 Boulevard de Grenelle (metro: Dupleix or Champ de Mars – Tour Eiffel) – Eiffel Tower | Closed Mondays. 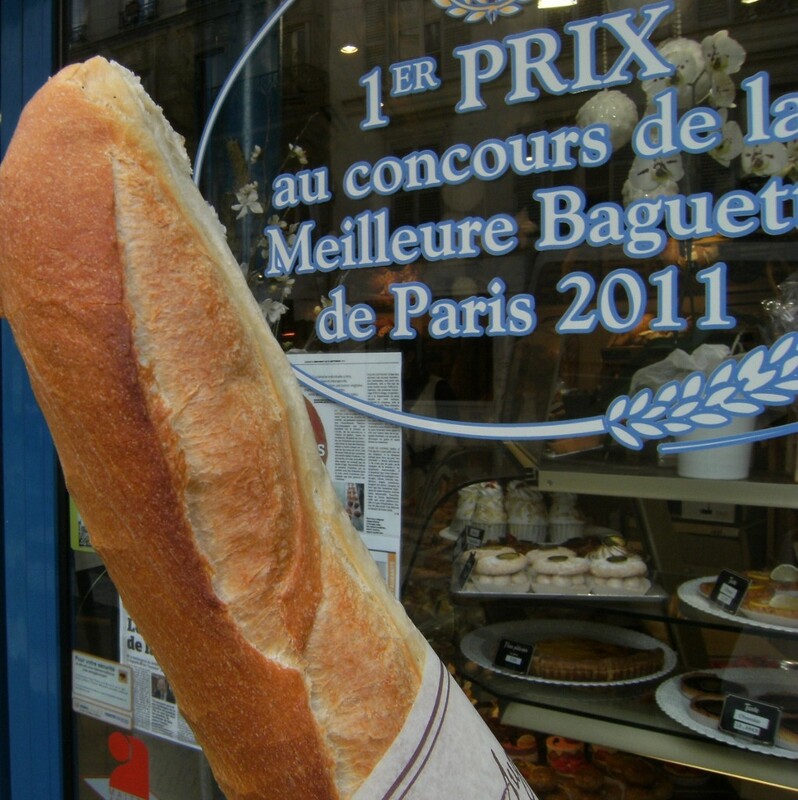 It’s won Best Baguette in Paris. Not an easy feat. The bread’s so airy, I squished it when they handed it to me. Best café crème I’ve ever had. The coffee and crème are served separately, so you can adjust it to taste. It’s classy inside with angel murals on the ceiling and lots of gold trimming. They’re known for macarons. 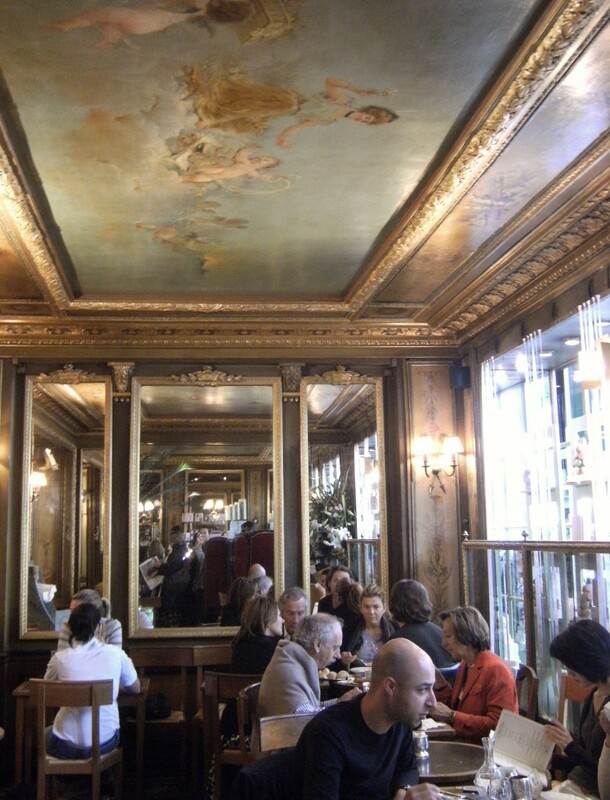 I have a shrimp sandwich at the Gosselin by Musée d’Orsay. The amazingly fresh bread makes the sandwich. 258 Boulevard Saint-Germain (metro: Musée d’Orsay) | Closed Sundays. 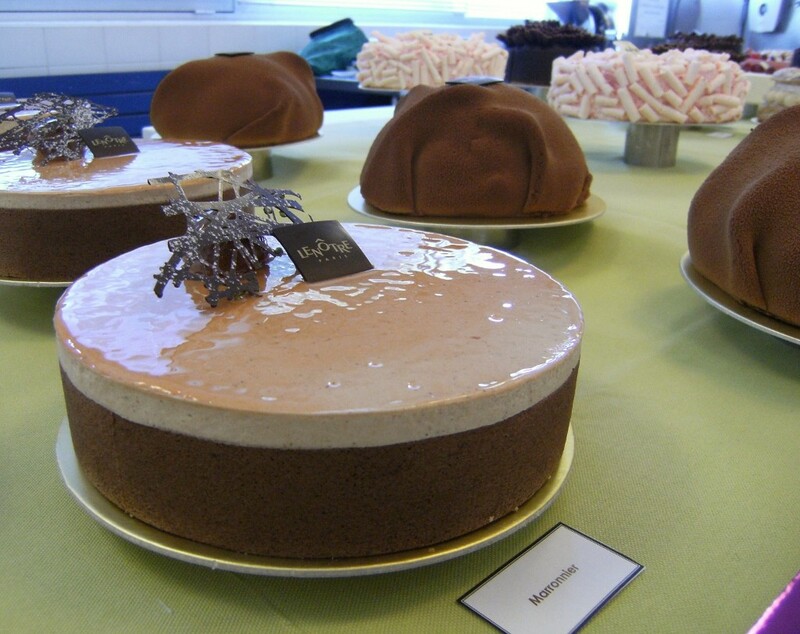 I went to pastry school at École Lenôtre in Plaisir. 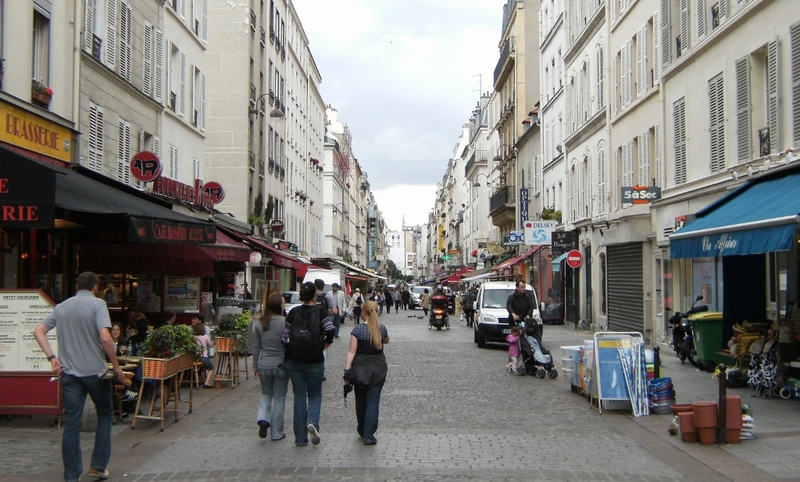 They also offer short cooking classes and demonstrations for all levels in Paris (check out Le Pavillon on the Champs Élysées). 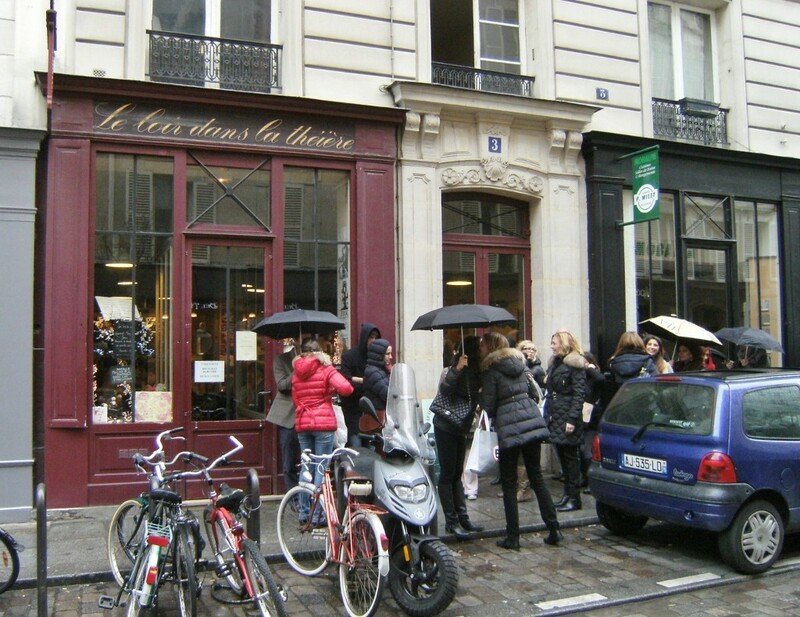 Or if you just want to buy a box of macarons, they have many boutiques in the city. Jon and I had scoped out a laundry mat near Place des Vosges where you can dry a load for just a Euro, so we slung over our laundry in some garbage bags. On our way back, I stop in Gérard Mulot. I sort of forget I have a sack full of laundry around my shoulder when I enter, but as soon as the door closes I realize just how large the sack is as I try to negotiate my way around the tiny shop. The girl is really sweet and amused that I brought in my laundry. I try to order some mini macaroons in French, and my attempt further amuses her. One’s not labeled, so I ask her what flavor it is. She pulls out a broken one and offers me a taste. Blueberry. 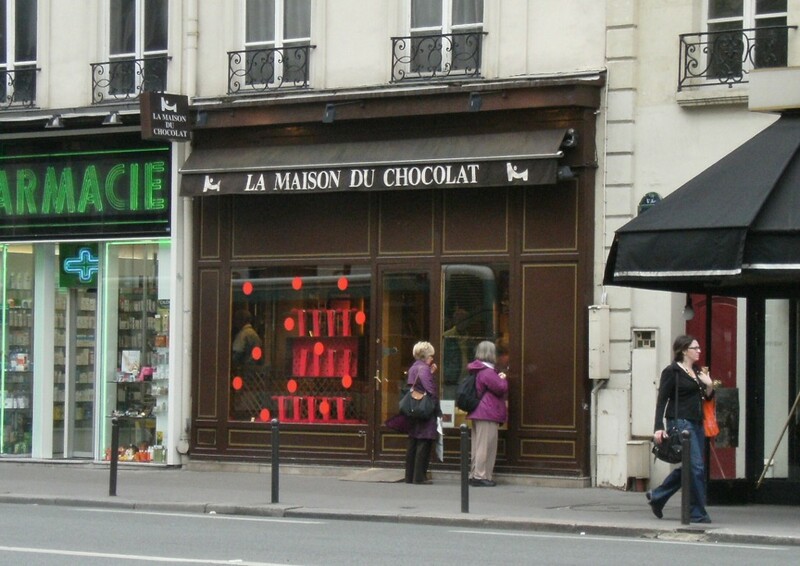 My sister, Teva, sent me a list of the best chocolate shops in Paris, so each week I’ve been trying a different one. I come when they’re closed (they have strange hours – Wed 2pm-7pm and Thurs-Sun 11am-7pm), but the lady is nice and lets me in anyways. It takes about an hour to drink the thick chocolate à l’ancienne because it’s so decadent. They’ve updated the old, whimsical interior into a cleaner-looking shop. It’s more a tearoom now, but still a great place for hot chocolate. 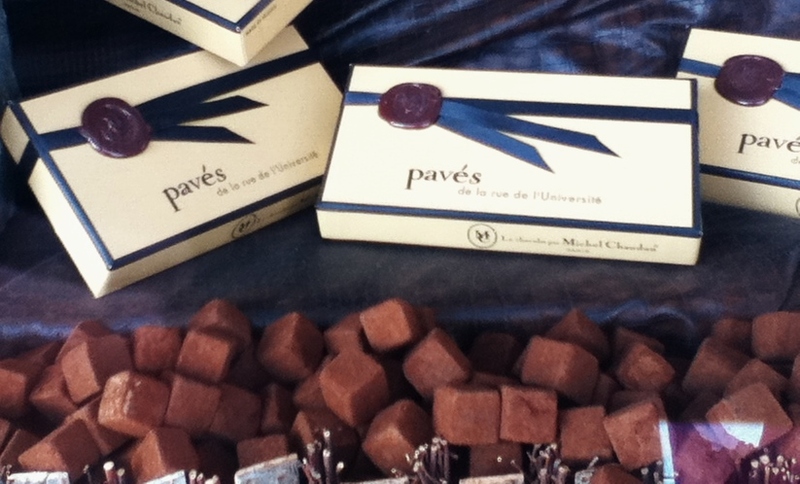 His chocolate pavés are unreal. It’s sort of like a super light, cube-shaped truffle. But there’s really nothing to compare it to. They come in various sized eggnog-yellow boxes, and the larger ones are imprinted with a wax seal. If you’re nice, they’ll probably give you a free sample. Hermé offers some uniquely flavored chocolates and macarons like rose petal or basil flower. He also has several recipe books. At the “House of Chocolate,” I taste a mint infused square of chocolate. The mint tastes so fresh, it’s almost more real than any mint could actually be. Like if real mint was Water Lilies, this was Giverny. I order the Bergamot Chocolate Cake. It’s a little rectangular cake with paper thin layers of lemon cream that tastes like a cup of Earl Grey. 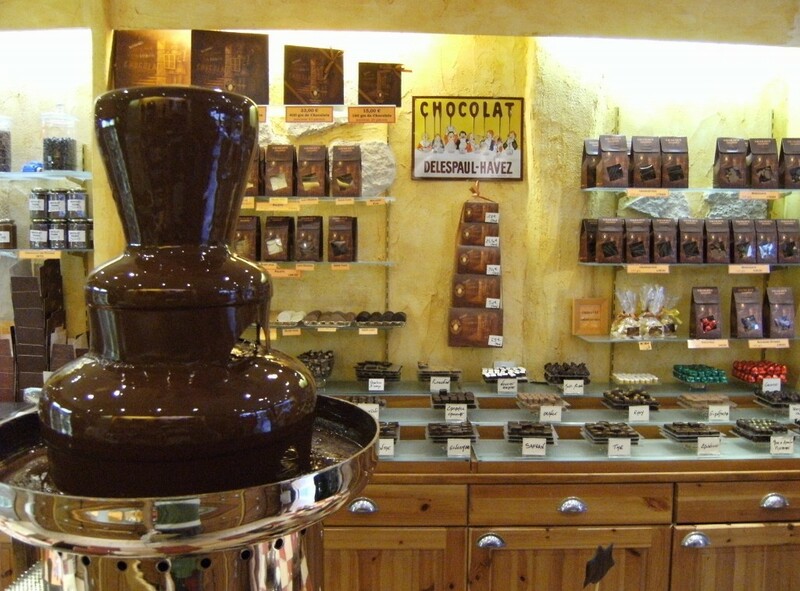 Imagine walking into a store, turning, and seeing a life-size chocolate gorilla. That’s Patrick Roger’s shop on boulevard Saint Germain. 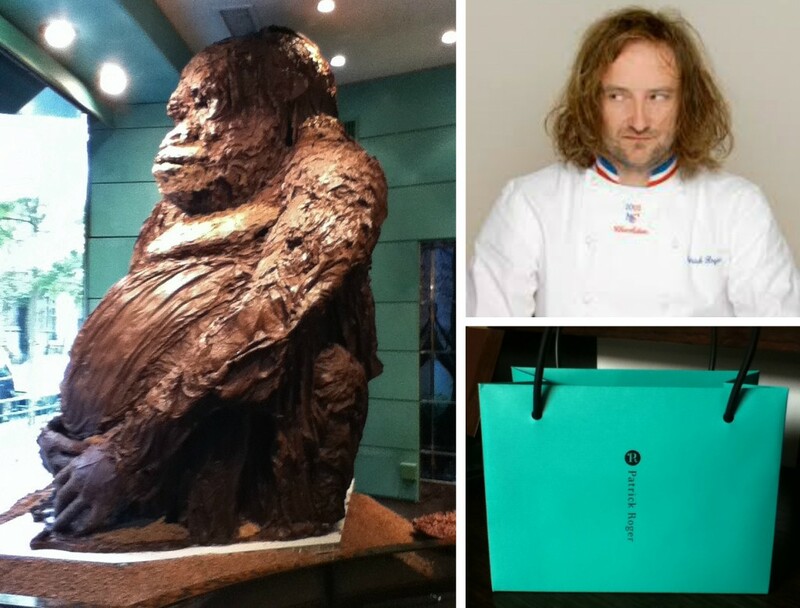 He won the MOF, best craftsman in France, for chocolate (and he kinda looks like Conan O’Brien with long hair…) Wouldn’t you like to get his chocolate bunny in your Easter basket? 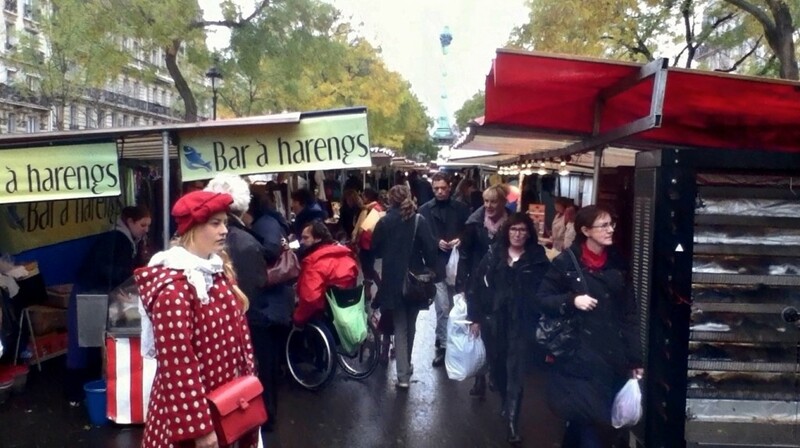 His truffles aren’t the best in Paris. I try a pretty tangy lemongrass one, but his sculptures are amazing. (Check out “Kings of Pastry” on Netflix if you wanna see the MOF competition). The shop window looks like a shoe store, except the shoes are chocolate. 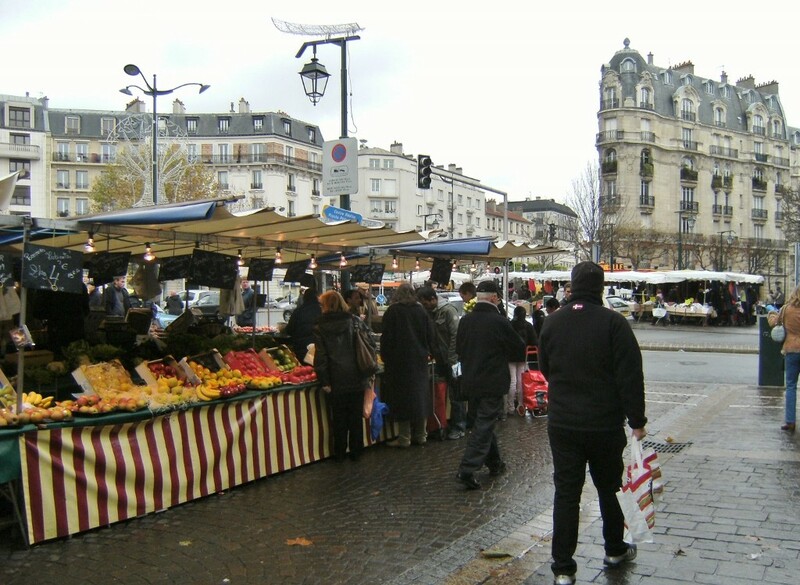 My favorite outdoor market on Boulevard Richard Lenoir with a view of the July Column rising up out of Place de la Bastille. 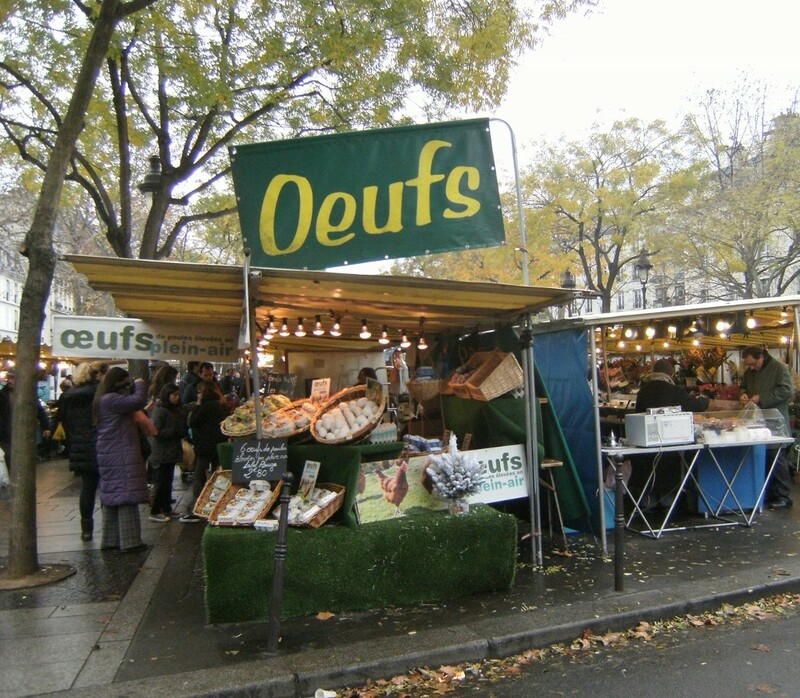 I’ve found conflicting names for this market, but it’s literally right there as you exit the St. Mandé metro stop. The morning air smells deliciously of rotisserie chickens, which are spinning five high on a contraption that allows the juices to drip down and flavor some roasted potatoes on the bottom. We purchase pastries, fresh fruit, meat on a stick, and a huge hunk of cheese chopped right off the wheel. We don’t want to waste any of the cheese, so we stash it in our hotel room, not realizing it’s about to smell up the whole place. You enter through an iron gate off of the street. 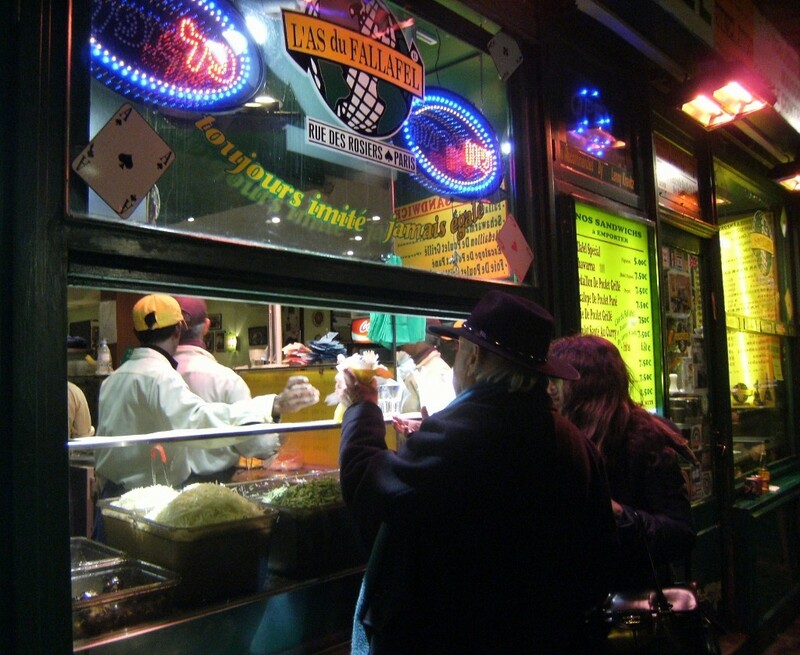 It’s a mix of ethnic cuisines, occupying these strange 1/4 sphere spaces. Unlike the other markets, you want to come here in the afternoon when the food stalls are open. 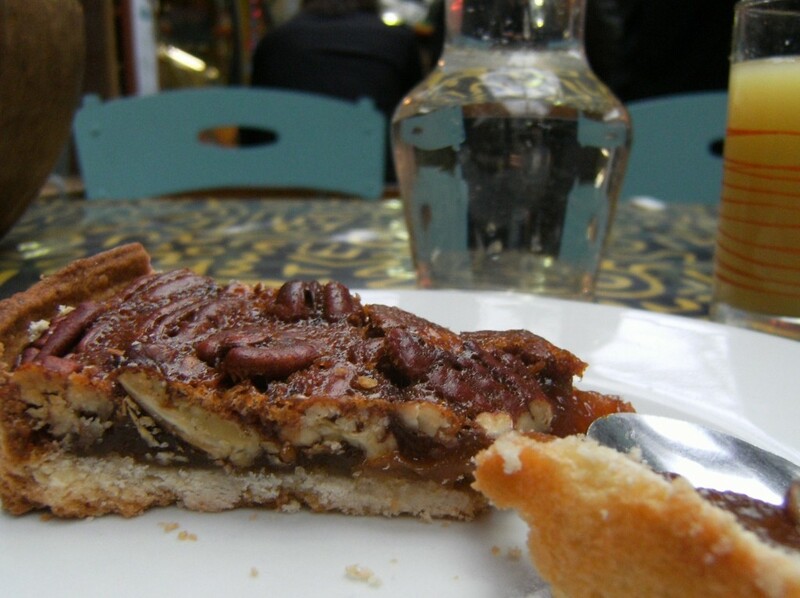 The Afro-Cajun-Creole stand offers a slice of pecan pie and a shot of fresh ginger juice, which burns the back of your throat, but it’s a nice, refreshing burn. 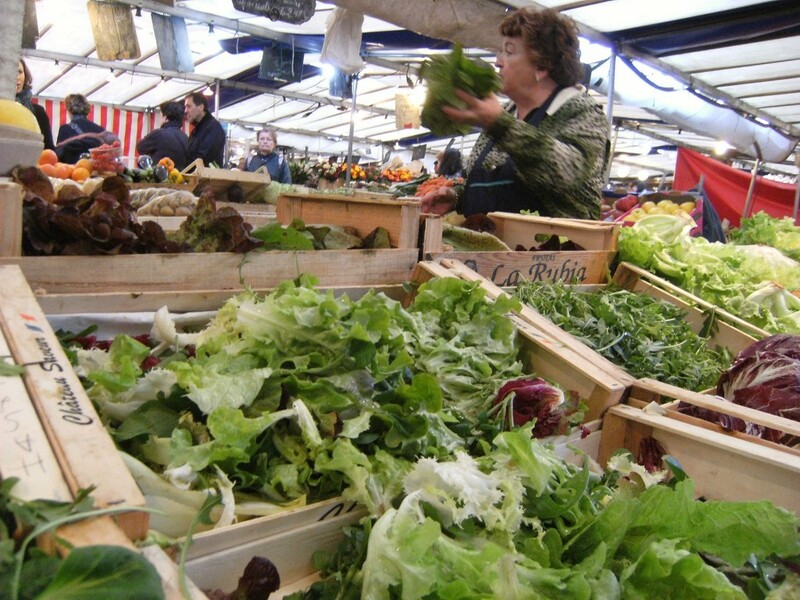 When you can’t find a marché en plein air, or outdoor farmers market, there’s always a market street. 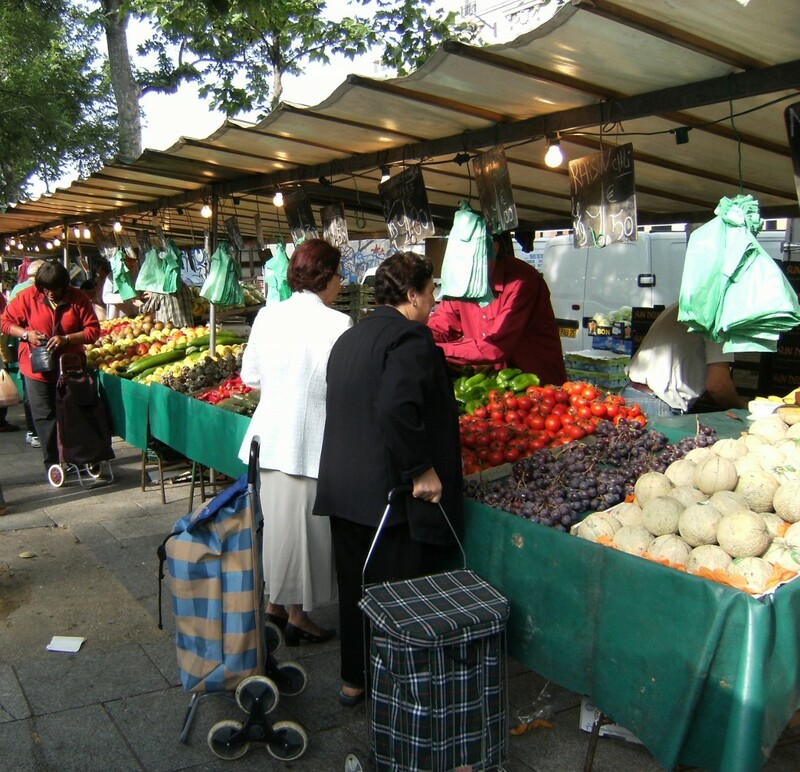 Tiny shops, like permanent stalls, sell specific products like chocolate, cheese, produce… Most shops close on Sundays, but that’s when all the farmers markets are open. 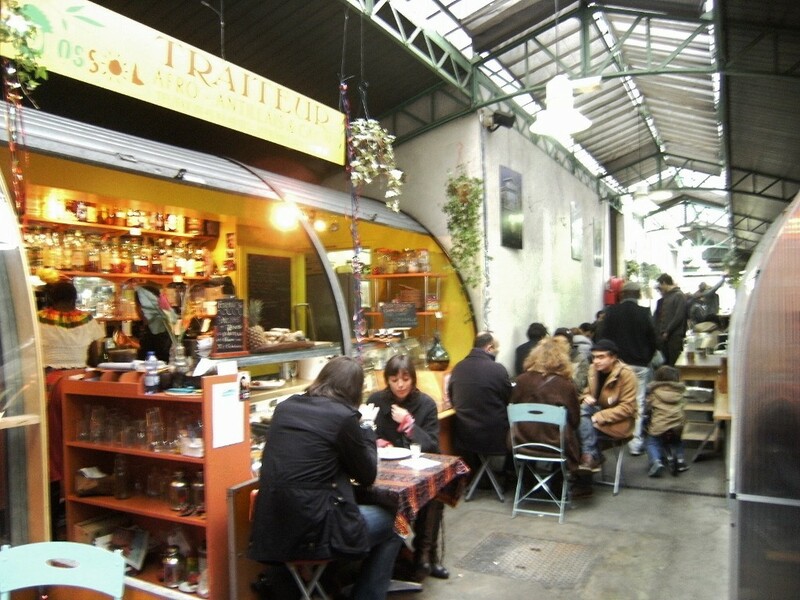 A few steps from the Eiffel Tower, this is a great place to pick up food for a picnic or some artisan products to take home as gifts. A little less touristy than Rue Cler. 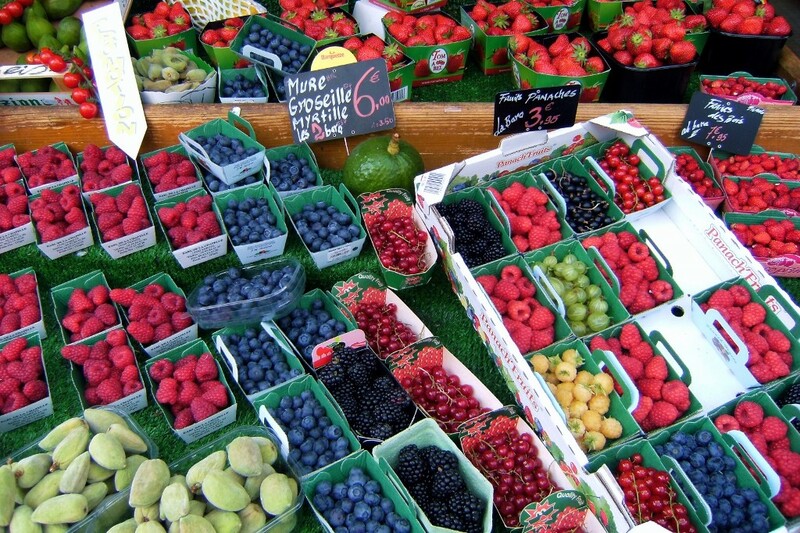 Pick up a crêpe or a baguette and some stinky cheese and then stroll over to the Luxembourg Gardens. 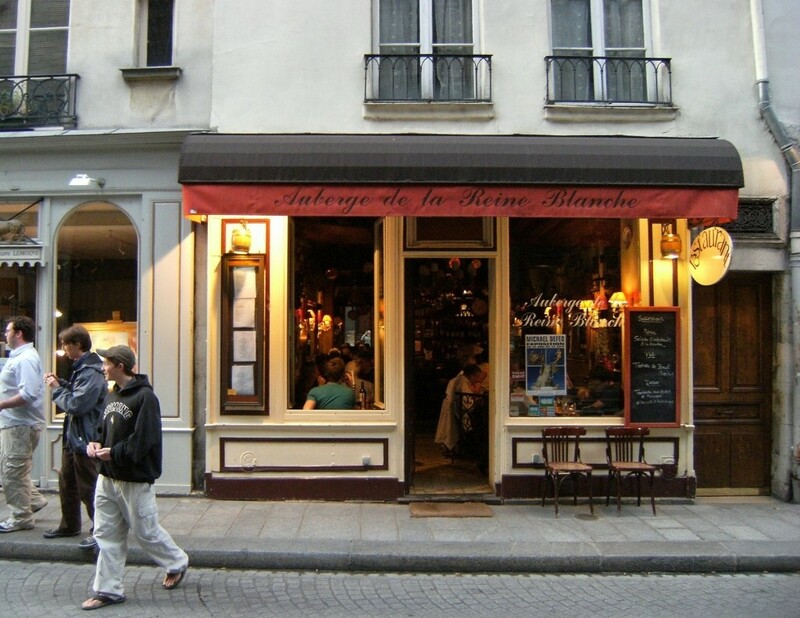 It’s one of the more reasonably priced, but still kind of expensive, restaurants on the island, Île St. Louis, in the middle of Seine. 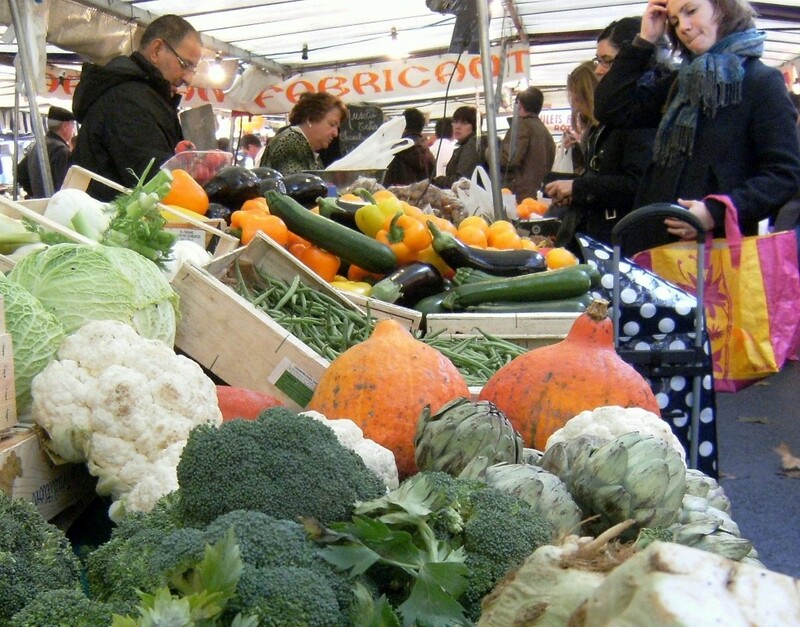 It offers nice traditional French food. We try foie gras with spicy marmalade that’s spread on toast, and escargot topped with melted butter and garlic. The fish kebab is served vertically on a metal stand. Watch your head if you go to the bathroom in the basement. The ceiling’s pretty low. 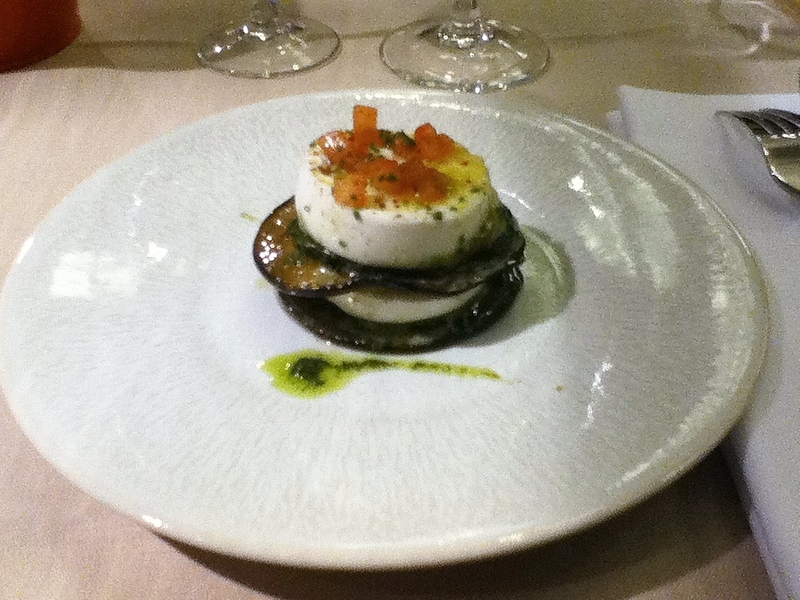 A Michelin 3 star in the Place des Vosges. 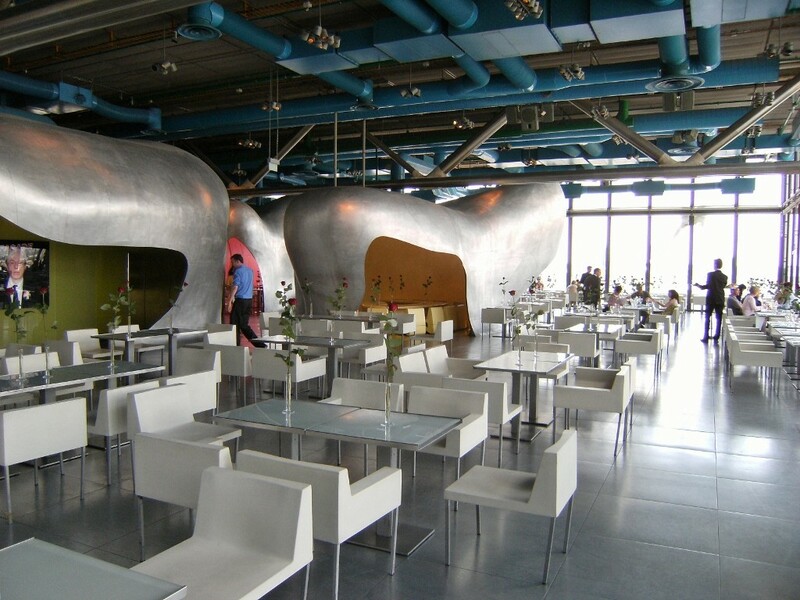 Inside the Pompidou Center. You’re paying for the view of the city as much as the food. Not a bad place to get on one knee and pop the question if you think the Eiffel Tower is too cliché. 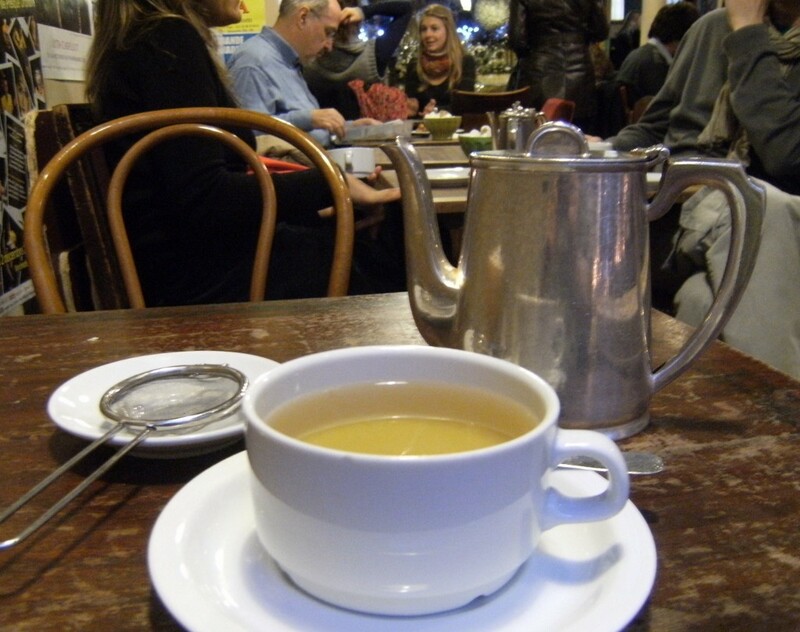 My favorite tea house in Paris. 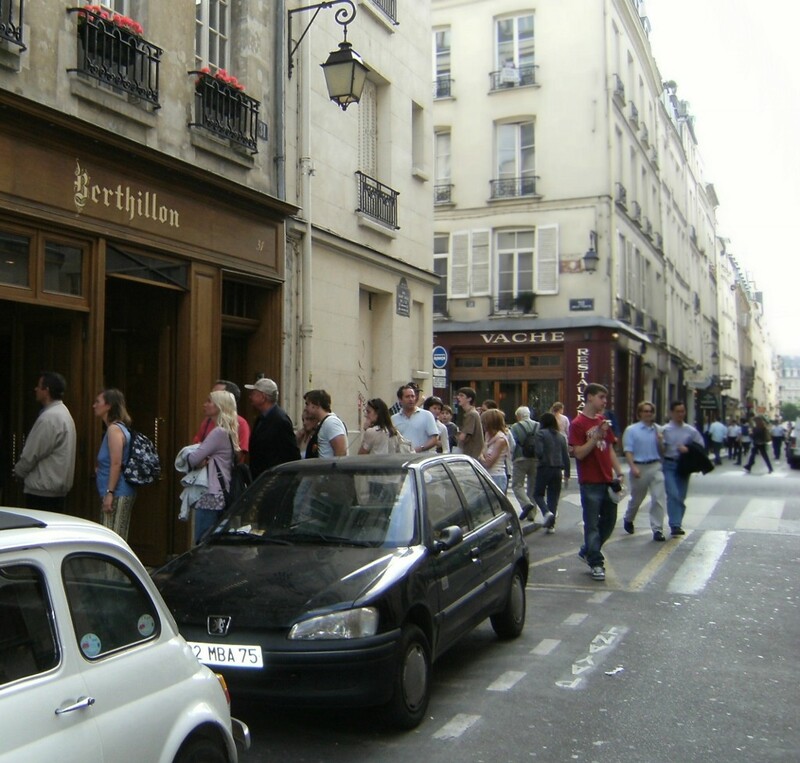 Don’t try coming here for Sunday brunch unless you’re like one of those crazy Parisians who line up down the block in the rain to get a seat. At lunch time you have to order food (I only eat lunch here once with Anita), but after 3pm everyday you can just order drinks like their house blend green tea, a mélange of figs, hibiscus, and strawberries. 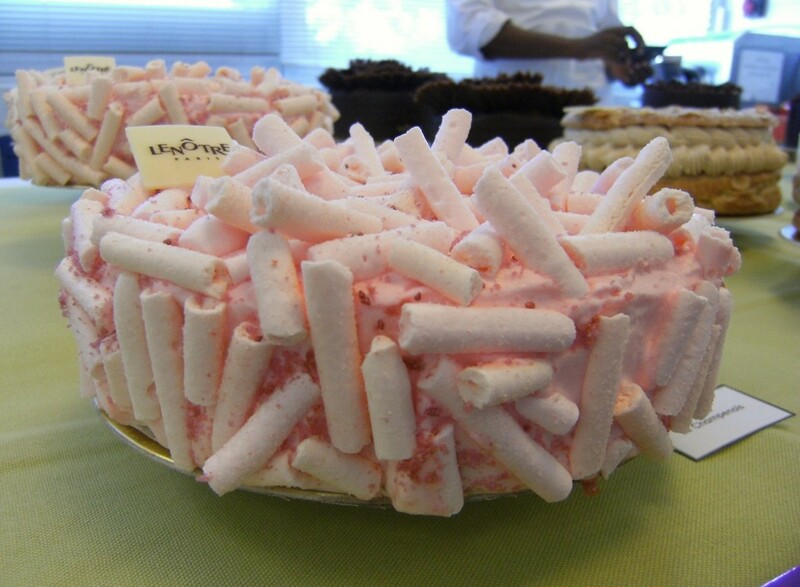 If you want to impress your friends, order something with meringue on it, and they’ll deliver a 6 inch high snowy mountain that usually flops over the moment the plate hits the table. I like sitting in the nook by the door with a pot of tea and a book. Another tea house similar to Le Loir, but with better food and a dinner option. 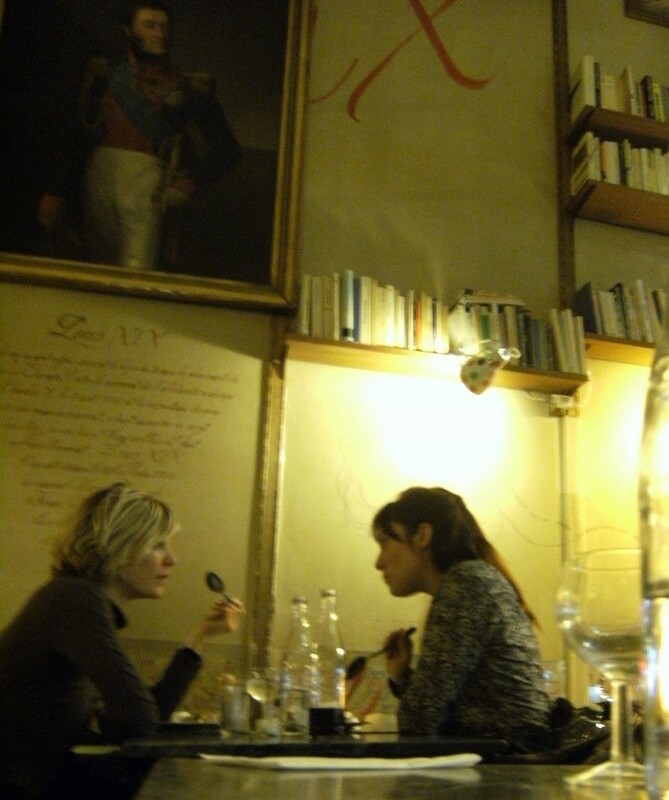 I share a romantic evening with a Parisian couple they sit me in the same four-person booth with. Throw out all restaurant norms here. There’s a big dog laying on the floor beside me, a man eating an apple from his pocket and playing computer games in front of me, a woman shouting, “Fermez la porte!” every time someone enters, and the waiter taking a break outside during the dinner rush to smoke a cigarette with his boyfriend. But I still recommend it. I order a medley of stuffed vegetables and Christmas tea. 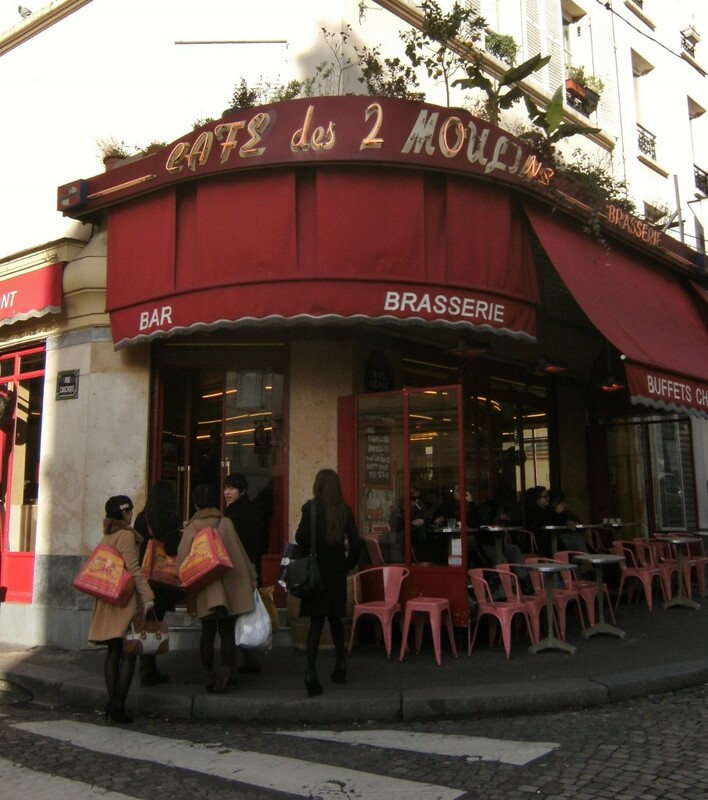 There’s nothing special about the food at Café des Deux Moulins, but it’s where Amélie works in the movie! It’s a shop, not a café, next door to the huge church. You can only buy beans and leaves here. If you don’t have a coffee maker or tea pot on hand, they make nice souvenirs. The owner roasts the beans fresh every morning. The shop smells wonderful. Adam and I purchase a churro-like pastry soaked in syrup. The honey inside is so intense that it pours out of the middle and burns the roof of your mouth. We convince a couple of American guys outside to buy one. “It’s like an elephant ear that has been soaked in syrup for a year!” the guy very accurately describes it. We agree we must share the Tunisian pastry experience with Ashlyn and Susanna, so we get the original, intense churro and then a lighter looking doughnut. When the man hands the doughnut to me, I almost drop it, not anticipating how heavy it is. If the original one weighs 3lbs, then the “light” one weighs at least 6. The thick syrup literally explodes in your mouth when you bite into them. 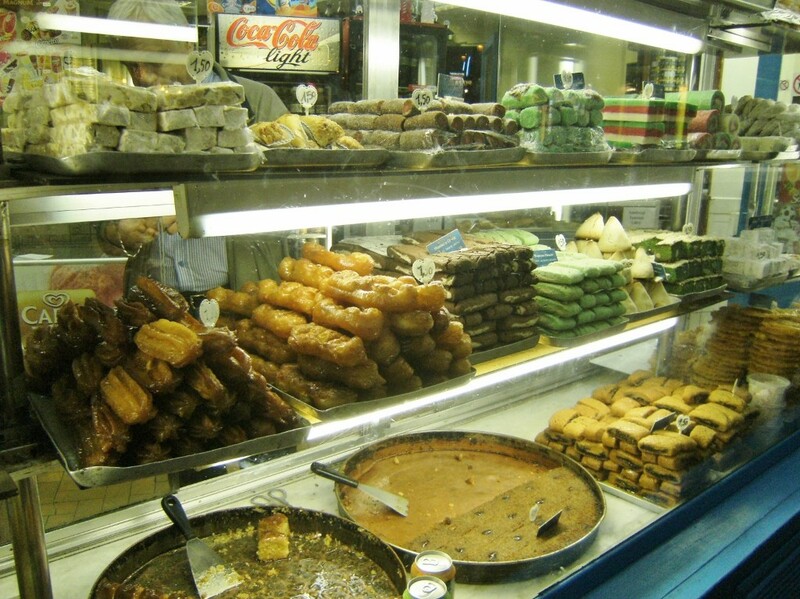 Eating a pastry here is like a rite of passage. You order off the street. They stuff their sandwiches so full of falafel, purple cabbage, eggplant, and dressing, you’ll need two hands to carry it. 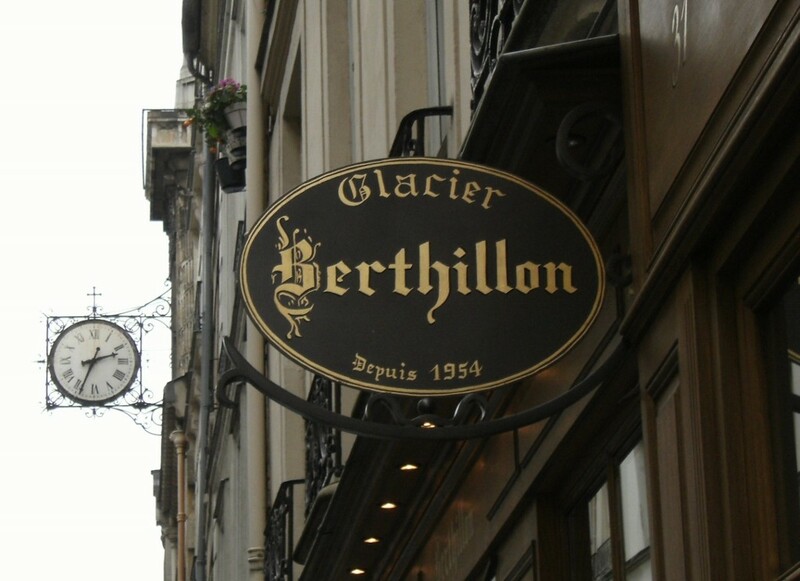 For ice cream, there’s nothing better than Berthillon, which has been around since the 50’s, and there are about five or six shops on Île St. Louis. The address is for the flagship store.